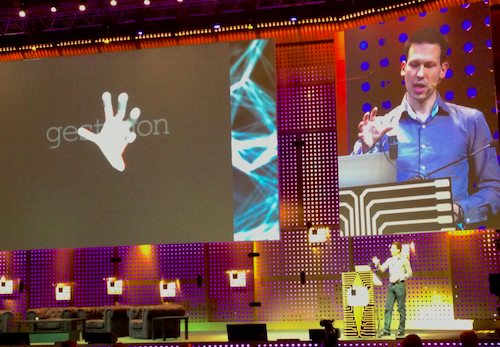 I have just attended my third LeWeb internet conference in Paris, my two previous were in 2007 and 2008. I was lured back to LeWeb due to their theme for this year: “Internet of Things”, a rapidly growing sector that I think will affect our society and businesses just as much as the current Internet has done so far, and where I see many new business development possibilities. I am somewhat overwhelmed with impressions from my three intense days here, so this will only be some tidbits of what I found interesting and some feedback on the conference format. My overall impression of LeWeb is that it has grown into one of the world’s biggest and most professionally organized internet conferences. There were a very mixed crowd from all over the globe attending and the topics of the talks was very varied as they should be, I was pleasantly surprised by some unexpected speakers. Step 2: Connect everything else! Enjoy his visionary talk, he is creating a very interesting platform for Internet of Things. Then I became totally absorbed in his storytelling and the way he transformed charity work with state-of-the-art social media tools. And they are using GPS-equipped well-drilling trucks that tweet their donors when they are drilling water wells i Africa! If you don’t have the 45 minutes to do that, see only the 5-minute video about Rachel a 9-year old with a borthday pledge. If you don’t cry when seeing this video, your heart is made of stone! Another surprise was Neelie Kroes, Vice President of the European Commission and responsible for the Digital Agenda. She is 71 years old and seems to be more sharp and updated about everything Internet and politics than most people. I was impressed by her wisdom and ability to give clear answers. My faith in the EU somewhat restored! Overall there were many smart women on the stage, for example the TechCrunch editor Alexia Tsotsis was a very skilled interviewer and the chairwoman Chris Chipley of the startup jury impressed me. Sigfox introduced a new type of global wireless network for Internet of Things: low power, long range (tens of km!) and low cost. Will be very interesting to see how this develops. Reallocate.org, a nonprofit that gathers developers to improve the quality of life for people with needs, great inititative! The winner of the LeWeb startup competition was QunB, a German company with an advanced tool for visualizing and analyzing data, their tag line: Broadcast your data! 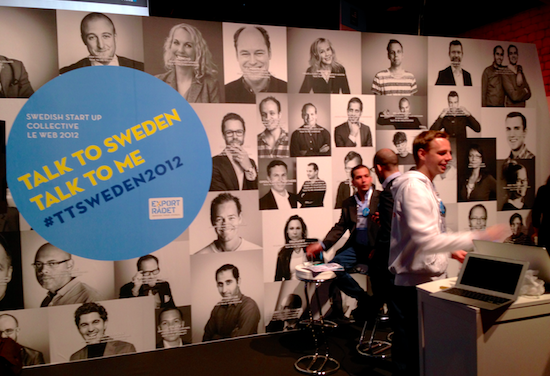 The Swedish Trade Council organized a booth for Swedish startups, it was a great success with lots of visitors and media from all over the world interviewing. Kudos also to LeWeb for the super-professional video and audio on all the stages. I have never seen any better video projection, and the music video jingles and intros were state-of-the-art too, as you can see in the LeWeb videos below. This picture does not show the splendor of the stage and video screens, but you get a hint. Here is Gestigon presenting their cool gesture-interpreting middle-ware platform. French food at its best. 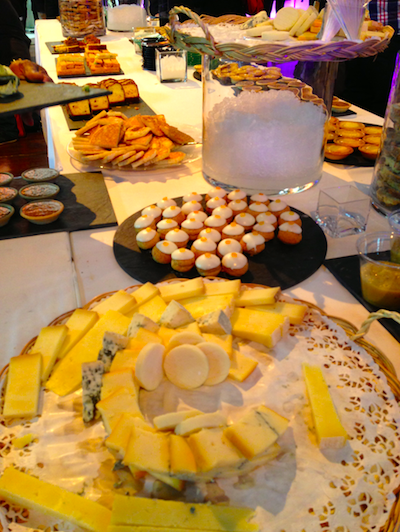 Conference organizers of the world, learn from LeWeb! As is too often the case with trade conferences, there were too many talks that were just sales pitches. This should be banned, each talk must give something of value to the audience that they cannot find on the speaker’s corporate web site. Also I feel that Loic Le Meur is a charming and energetic host, but he is doing too much back slapping of his friends on the stage and too many “Oh, that is awesome!” to everything being presented, even the quirky stuff. It would be more interesting with a more journalistic style, where the moderator asks also a bit tougher questions. I also think there was a little too much focus on American speakers, it seems that we Europeans are mesmerized by all Americans that are famous, forgetting that we do have our own stars in Europe and also the main part of our business usually comes from European customers. The mingling and networking is always very important at events like this, but there were way to few tables and chairs for this at LeWeb. The LeWeb website is inexplicably lacking most of the basic stuff an event web site must have, such as: search, descriptions of the speakers and their talks, a list of the exhibitors with descriptions of what they are showing, the videos from the talks etc. It doesn’t even have a proper map of the venue and the exhibitions, where it is located in Paris, and you cannot search for it in Google maps since the street address given is not searchable. I recommend LeWeb to give their web site a complete overhaul and start using a suitable online networking tool that facilitates networking among the participants before, during and after the event. LeWeb is using a tool called Presdo Match, which I found totally inadequate. I stumbled on a much better tool at LeWeb, the Danish startup Conferize that looks promising. So based on all this I have updated my post about “Conferences Do’s and Don’ts with my findings from LeWeb. Check it out if you are interested in how to organize state-of-the-art conferences.